I made these muffins for my kids and husband on Sunday morning. They were super quick and easy to make and they smelled amazing while they baked in the oven. These muffins were the perfect way to use up my tart blueberries that I had in the refrigerator. The kids ABSOLUTELY loved the muffins and so did my husband. They didn’t last long and the kids have already asked for another batch. I’d say that makes this recipe a keeper! Preheat oven to 400 degrees and coat a 12 cup muffin tin with cooking spray. Toast 1/2 cup of coconut. Place the coconut in a thin layer on a baking sheet. Place into the oven and watch very carefully so it doesn’t burn. Toss to brown evenly. Remove from the oven and let it cool. Combine flours, baking powder, salt, and sugar together in a large bowl. Add the toasted coconut and combine. Using an immersion blender, mix together the egg, butter, milk, and vanilla until well combined. Slowly pour the dry ingredients into the wet ingredients and mix well. 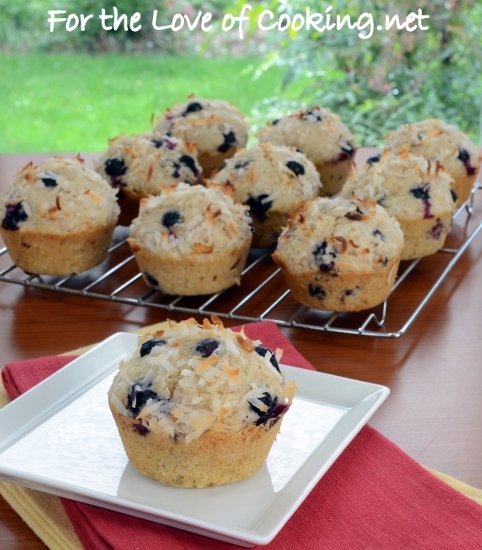 Fold in most of the blueberries gently into the muffin batter. Divide the batter among muffin cups (I only used 11 of the cups). 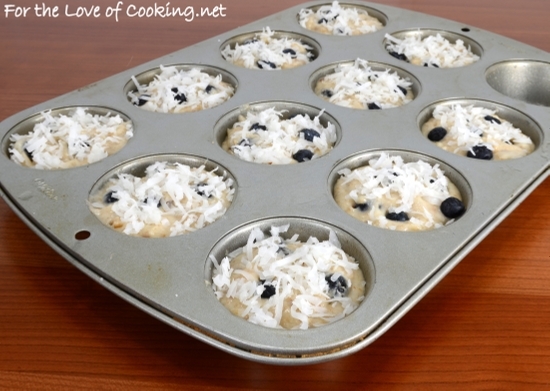 Sprinkle the (un-toasted) coconut evenly over the top of each muffin followed by the remaining blueberries. Bake for 18-20 minutes or until a tester inserted into the center of a muffin comes out clean. Cool for a few minutes in the muffin tin then remove from the tin and let them cool on a cooling rack. Enjoy. Toast the coconut. Place the coconut in a thin layer on a baking sheet. Place into the oven and watch very carefully so it doesn't burn. Toss to brown evenly. Remove from the oven and let it cool. Oh those sound so wonderful! These look so good Pam! I can’t wait to make these. We love coconut and blueberries! Bookmarking this!! It seems that blueberry muffins are always a hit, these look especially yummy! wow Pam, can I come over for the tea? These muffins look beyond delicious!! This looks yummy! Love the combination of blueberry and coconut. Great post! I especially love that last photo of the outdoor shot of these muffins. Lovely! I sure wish I could wake up to this tomorrow morning! Sounds so delicious! Have a great day! These sound wonderful, Pam! with the coconut on top they would be perfect. Looks yummy!!!! Yum, your muffins look so delicious! They look and sound incredibly delicious, Pam. You have one lucky family!!! I’ve been craving coconut all week and was actually trying to think of what to pair it with in a muffin. I was thinking dates but after seeing these I’m going to go with blueberries. Now I just have to get to a grocery store. oooh, sitting on a patio on a nice spring day eating these muffins sounds like the perfect morning! 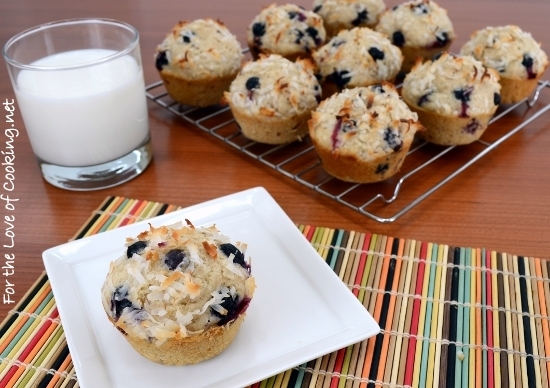 love the muffins, coconut and blueberry sound like a great combo! 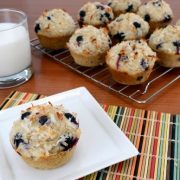 I love the flavor of toasted coconut and never thought to try it on a muffin, these look delicious! The coconut on top is a great idea! BTW, the book I mentioned on Monday is a “public domain” book, and therefore free for your Kindle if you want to have fun browsing it, as I did! I have some frozen cherries in the fridge so I think I’m going to try these out with those! I dont have an immersion blender. What should I use instead? A regular blender or a mixer would work just fine. You could also just use a whisk too. I love the coconut with the blueberries, sounds like a great combination. Hi! I am thinking of making these this weekend but in reviewing the recipe I have a few questions. Why do the blueberries need to be divided? It looks like they all go in at once? Also, so the muffins bake at 400 degrees or is that just the temp to toast the coconut and then they should be baked at a lesser temperature? Thanks – can’t wait to try these! I am sorry the recipe wasn’t more clear, I have corrected that. You cook the muffins at 400 degrees as well as toast the coconut. 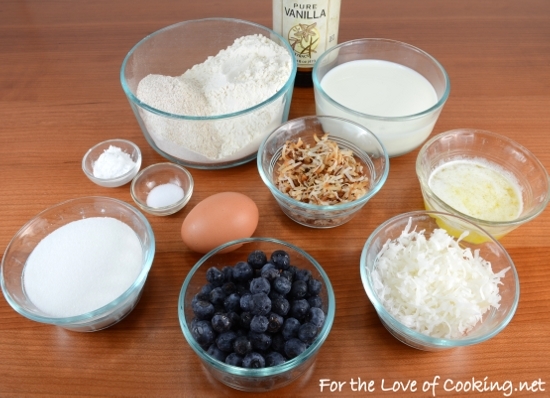 You add most of the blueberries into the batter but sprinkle a few on the top of each muffin along with the coconut. I hope this helps. this looks soooooo good Pam. I’m gonna use this recipe as a base this weekend.. i wanna make these for sunday morning. YUM! Thanks for sharing. I normally don’t like a lot of coconut flake but in this case the blueberry sweetness would balance it and taste great, I think. Toasted coconut + blueberries = you have my heart! I love the toasted coconut on top! Adds a nice bit of colour and must add a lovely flavour too. I have to admit these are my new favorite…lol they are addicting! I do not know if it’s just me or if everybody else encountering problems with your site. It appears as if some of the written text in your posts are running off the screen. Can someone else please comment and let me know if this is happening to them too? This may be a issue with my browser because I’ve had this happen before. I have not had any other readers complain of this problem so I am wondering if it is your browser. Can you try viewing my site using Chrome or another browser? Sorry for the problems – wish I could be of more help. hi pam these i want to make these for mothers day but for the coconut did you used packaged shredded coconut or did you shred a fresh coconut yourself? I used packaged sweetened coconut. I replace the butter with Almond Oil and the Milk with Coconut and used 1/4 cup of sugar and my 16 month old loved them. I have since done a few variations including swapping the blueberries for chocolate chips which disappeared very quickly! I am sad to say that these did not turn out amazing. The texture was quite good, as well as the appearance, but they were almost flavourless. I used coconut oil instead of butter to try and amp up the cocnut flavour, but it didn’t seem to make much of a difference. Thank you so much for the receipe. They really look yummy. Can I replace whole wheat flour with white/all purpose flour? Yes… all purpose flour will work just fine. Thank you so much for this receipe. I made these muffins today and they turned out very delicious! My husband and I enjoyed them.